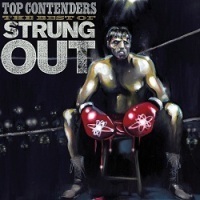 STRUNG OUT Top Contenders: The Best Of out now! Plus free MP3! Strung Out retrospective, Top Contenders, celebrating their 20 year career is out today! Fans can expect 23 catalog tracks, culled from each of their 7 albums and 2 EP’s, all fully REMIXED from the original tapes by Ryan Greene. As a special bonus, the band recorded 3 brand new songs exclusively for this release. Listen to Top Contenders in its entirely by clicking here! The packaging boasts a front cover with an original painting by vocalist Jason Cruz, a huge collage with photos of hundreds of fans’ Strung Out tattoos, and more. This release is available on CD, double LP and digitally. As a special bonus, we are offering “Firecracker” away as a free download-get it here! Strung Out are heading to Europe in July, check their dates here. Strung Out on twitter, facebook, myspace and their webstore! Want to win a guitar signed by Strung Out? Click here!